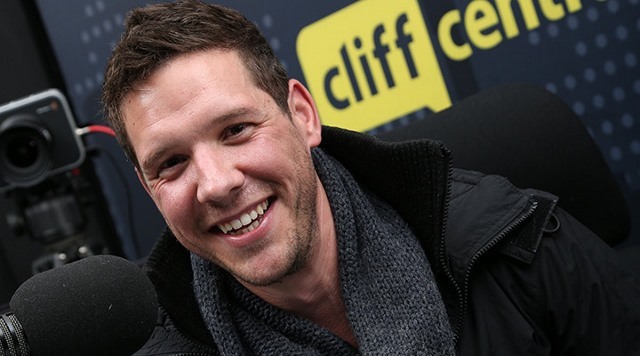 When you get a call from Carte Blanche you have either done something really bad or something incredible. In this case it was something incredible! 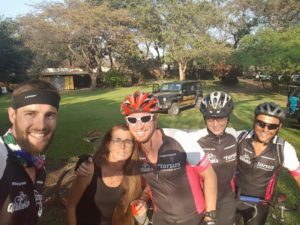 Carte Blanche recently visited Warrick & Camilla at their home to find out more about their recent Joburg2Kili Expedition they took on with fellow cyclists Gareth Pickering and Derrick Fourie as well as their support crew Bobby Fuller and Bryan Fawcett. 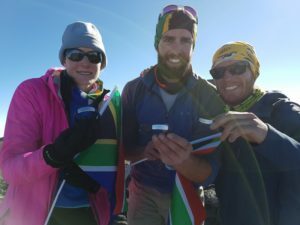 Joburg2Kili cyclists, Warrick and Camilla Kernes and Gareth Pickering successfully summited Mount Kilimanjaro on the morning of the 15th October 2016 which was also a special day for the Kernes as it was their 5th wedding anniversary. 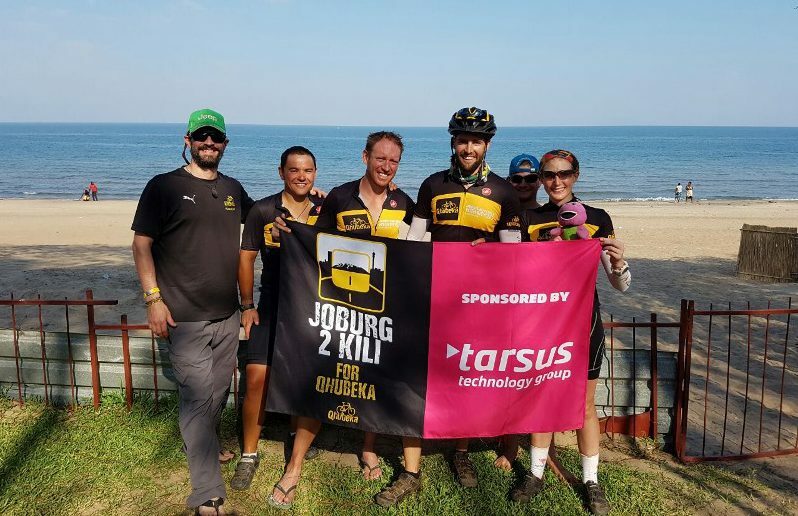 Climbing Mount Kilimanjaro was the final challenge of the #Joburg2Kili for Qhubeka powered by Tarsus Expedition which was an emotional and incredible experience for the team to be on the top of Africa after cycling 4650km on Qhubeka. 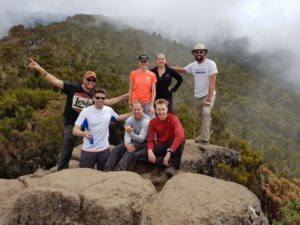 Here is a daily recap on the teams Mount Kilimanjaro Experience. From Springlands Hotel we were bused to Machame Gate on the Eastern side of the mountain. At the Gate we had to sign in and wait whilst our porters and guides finalised preparations. We were all amazed at how many other tourists were also there to climb the mountain – there must have been over 150 people. Eventually after an hour of waiting we were called to start making our way to the start of the climb where we met up with a group of three British guys called Simon, James and John who were all mates and a girl called Kate. We ended up hiking with them and their guide Frankie all the way to the camp. Our guide Gilbert still had to get some permits sorted out at the Gate but he caught up with us after about an hour of walking. The hike from the gate to Machame Camp is around 11km through a beautiful rainforest. You climb from 1800m in elevation up to just below 3000m so it is a steady incline the whole way. We arrived at Machame Camp in the late afternoon and it was very misty all around. We were shown to our tents and given a bowl of water each for washing. We then had tea and popcorn followed by a delicious dinner in our dining room tent. The next morning, we were woken up at 7am and given a bowl of water for washing. By 7.30am we had to be packed with our big bags so the porters could take them and start making their way to the next camp. After eating a very decent breakfast we got our Camelbaks and water bottles refilled with water and finalised our day packs before heading off on a 5km hike to Shira Cave Camp along with the British group from the previous day. It is amazing how the vegetation changes so drastically the higher you climb. We were now hiking through the Moorland area which is very rocky with short trees which are covered in old mans’ beard. 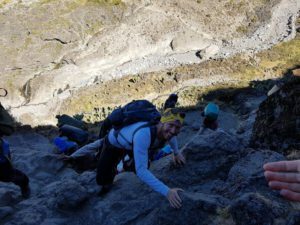 Although it is only 5km to the next camp it is a very tough day of hiking as you are climbing up a very rocky and steep pathway for the majority of the day. The route starts to flatten out a bit and this is where we got to finally start seeing the peak of the mountain. About an hour away from camp, Cam had a sugar low and felt like she was going to faint. Both Gilbert and Frankie used a device they were carrying to check her blood pressure which was very low but the oxygenation of her blood was normal. At first the guides suggested she should go back but as Cam has had this happen before she asked if she could just eat something sugary and rest a bit to see if she feels better again before making a decision on whether to carry on or not. Gareth and the British group decided to continue hiking towards camp whilst Warrick, Cam and the two guides Gilbert and Frankie rested in some shade for a bit. After a Gu and some biscuits and lots of water, Cam started to feel a lot better and so it was decided that we would carry on hiking very slowly towards the camp. A few tears were shed when Cam and Warrick made it to Shira Cave Camp. 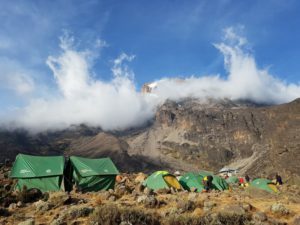 After eating a late lunch, we rested up in our tents before being called to go on an acclimatisation afternoon walk up to just below 4000m in elevation to Shira 2 Camp. On the walk, Gilbert showed us one of the caves where the porters used to stay in the past but now they all stay in tents. 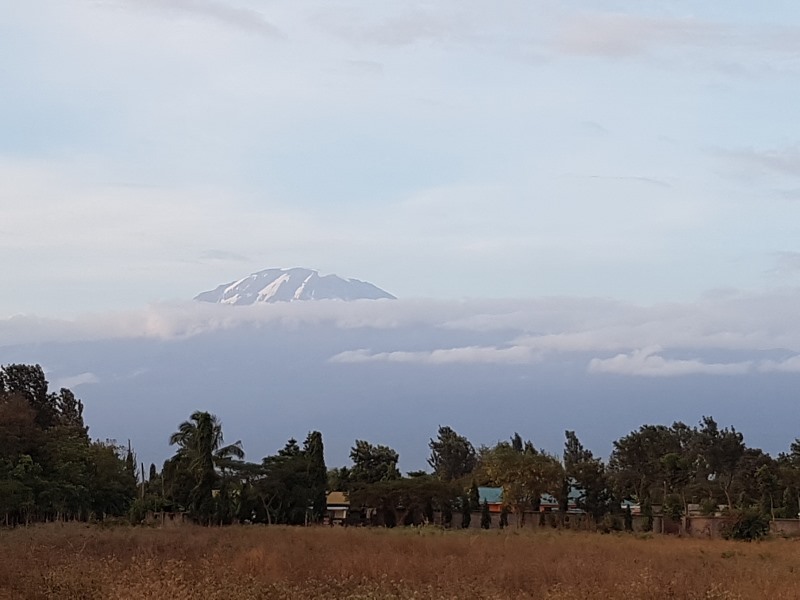 Whilst walking the weather changed from being misty and cold to being sunny which cleared the clouds around the peak of the mountain giving us an incredible view of Mount Kilimanjaro. Once back at camp we had an early evening dinner in our dining room tent which was mounted next to the British groups tent so we could all socialise which was great. The morning routine remained the same as the previous day with a wake-up call at 7am, breakfast at 7.30am and leaving camp just after 8am. 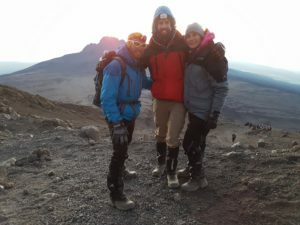 We were led by Mzui, who was the British groups assistant guide, who set a very pole-pole (Swahili for slow) pace as we were going to be climbing up to an elevation of 4600m at the Lava Tower and then descending to 3900m at Baranco Camp where we would be camping for the night. It is amazing to see how the vegetation changes along the way from small bushes to a desert of lava formed rocks and sand. The climb up to the Lava Tower is gradual but what makes it challenging is that you start to notice that it is getting harder to breathe. At the Lava Tower we rested and ate our packed lunches that the chef had prepared for us. We then started our descent down to Baranco camp. On our way down the British girl, Kate, started to have issues with her knee so we ended up walking pole-pole and taking a lot of breaks as we made our way to the camp. When we arrived at Baranco camp it was very misty and cold but in a few minutes it cleared up a bit to present us with an incredible view of the mountain. We woke up to a beautiful clear, blue sky with a spectacular view of the mountain. We had quite a tough start to the day ahead of us as we had to get up and over Baranco wall, which is an almost vertical rock face that you have to ascend and end up rock climbing in some sections. It was very crowded climbing up the wall but it was impressive to watch how the porters manage to carry so much on their heads, shoulders and backs up some of the hectic rock climbing sections of the wall. After climbing Baranco wall, the rest of the hike through to Karanga camp is relatively easy going other than just before the camp where you have to descend this hectic pass down to a river and back up again to the camp. 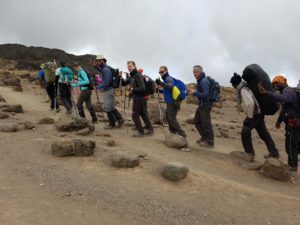 This was our last hike with the British group as they were on a 6-day package so they had to carry on hiking past Karanga camp onto Barafu camp, which is the base camp where you start your summit climb. Once at Karanga camp we had a delicious lunch followed by a short rest period before going on a acclimatisation walk with our assistant guide Ngwasha. It was very misty and cold on our afternoon walk so we couldn’t really see much but that evening we had one of the clearest nights on the mountain with a sky filled with stars and an almost full moon. We woke up to a crisp morning with blue skies and once again breath-taking views of the landscape around us and the mountain. We had a short 4km hike through to Barafu camp where we would be starting our summit climb. The first few kilometres of the hike was up a steady incline where we just continued walking pole-pole following Ngwasha. The rest of the hike was fairly easy with one final steepish climb up to the camp. 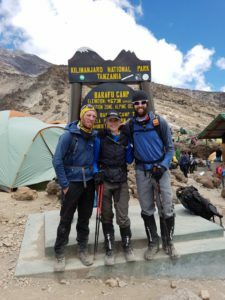 As we got to our tents we were very happy to bump into the three British guys who had all successfully summited that morning. They were in a bit of rush though as they had decided to rather hike all the way down the mountain to go back to the hotel for the night instead of camping once last night. They informed us that Kate was still ascending up to the summit when they had started their descent. After congratulating the guys we had a quick lunch and went to rest in our tents. Whilst we were resting up we were pleased to hear Kate return back to camp having successfully summited but she was looking absolutely exhausted. In the late afternoon, Ngwasha took us on another acclimatisation walk up to an elevation of around 4800m and back down to camp. He was also able to show us the route we would be taking up the mountain to summit leaving at midnight. We then had an early dinner followed by a briefing by Gilbert on what we needed to prepare for in terms of our summit attempt in terms of what to wear to stay warm, how much to drink and eat and some breathing techniques. We were all very quiet that night and you could feel the nervous tension in the air. Just before midnight we were woken up to start getting ready for our summit attempt. We layered up in all our clothes and grabbed a quick coffee and popcorn before starting our hike up the “small hill” as Gilbert our guide put it. We seemed to be one of the last groups to start climbing as you could see all the headlamps creating a pathway of lights up the mountain. Gilbert set a very pole-pole pace for us as we started the big climb up the switchbacks of the mountain. It is very hard going as you are hiking on scree so whenever you step on a steep section you feel your foot sliding back down a bit. The summit climb is a lot tougher than you would expect and as you reach over 5000m in elevation you start to notice how the altitude really effects people. We ended up passing fellow hikers that were seriously not well which is quite emotional. We had quite a bit of wind on our way up which made our fingers and toes go numb. Gilbert also tried not to stop too often as the longer you stop the colder you get so instead we just kept moving pole-pole up the steep slope. Just before sunrise, Gareth started to feel a bit dizzy and nauseous. After taking a bit of time to let him rest we then continued up the mountain at a very pole-pole pace whilst the sun came up. We eventually reached Stella Point after over 5 hours of climbing where we took a short break to have some tea and something to eat. From Stella point you can finally see where the summit point is which definitely helped lift spirits. We then continued onwards at a pole-pole pace along the rim of the crater and enjoyed viewing the incredible glacier formations along the way. It was tough going for us all on that last stretch not only because of the altitude but also because it just seemed to be taking forever to get to the end point and so many fellow hikers were passing us that had already summited. 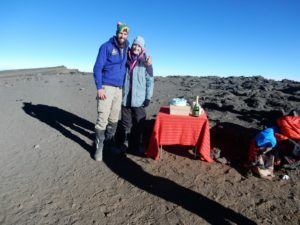 We finally saw the famous Mount Kilimanjaro sign where our assistant guide Ngwasha was standing next to a table he had prepared with a bottle of champagne and a cake in a box which was a surprise for Cam and Warrick for their 5th wedding anniversary. 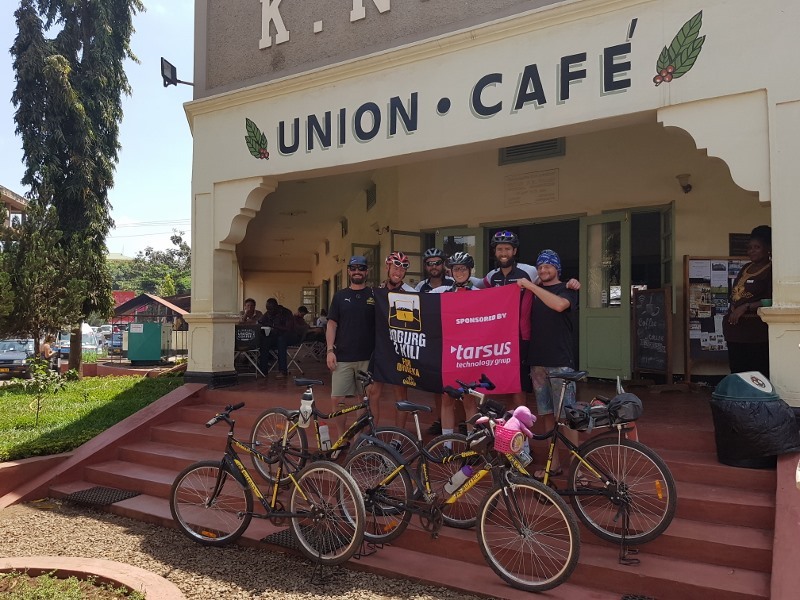 Lots of tears of joy were shed as we all felt the enormity of what we had achieved cycling 4650km to Moshi and climbing up to the top of Africa. After popping the champagne and cutting the cake, we had to deal with the crowds of hikers to get our turn to have a summit photo. 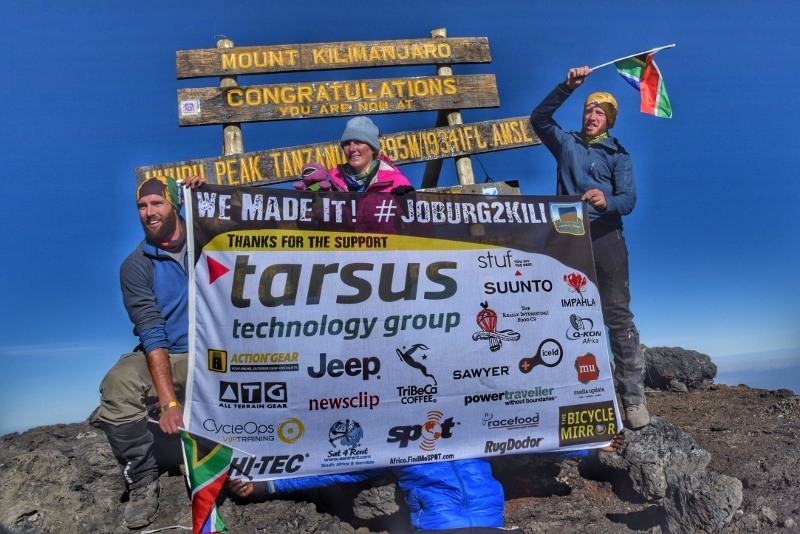 One of our sponsors, Tarsus Distribution, managed to arrange for us to all have a “Conquering for Gugu” bracelet made by Absa that we all left behind at the top of mountain in memory of the legendary South African racing driver Gugu Zulu. 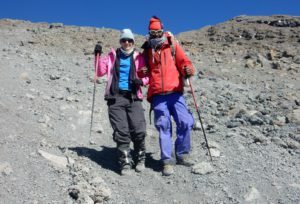 After spending close to an hour at the summit it was time to start our descent back down to Barafu camp. Gareth and Warrick loved the descent and were running/skiing down the loose scree on the mountain. Ngwasha helped Cam who was a bit terrified of sliding down the loose scree. 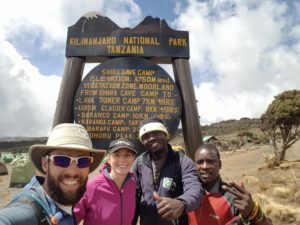 We eventually got back down to Barafu camp just after 10am where we decided that we wanted to skip camping the last night on the mountain and rather go straight back to the hotel so that we could all have a decent shower and good nights’ rest. After eating some breakfast we packed up our bags and set off on the long trek down the mountain. It ended up taking us 7 hours to descend the mountain which was a lot harder than we had expected. Warrick was suffering as his one knee started to hurt whilst hiking down the rocky section between High camp and Mweka camp. From Mweka camp it is 10km to the Mweka Gate through the rainforest which is really beautiful; however, we were all feeling exhausted and were so over the constant pounding on our legs from the descent. We did manage to see Black and White Colobus monkeys in the rainforest which was awesome. At the end of the Mweka hiking trail you get to a dirt road which is the last stretch before the Gate and luckily there was a car waiting that was in fact an ambulance. Gilbert told us all to get into the ambulance and arranged for them to kindly drive us down to the gate much to our relief as we were all absolutely exhausted. At the Gate we had to fill in a few forms and then we were shown to a table that had been set up for us to have dinner which was such a wonderful surprise after an incredibly long day on the mountain. We then got into a bus with the rest of the crew and were taken back to Springlands Hotel in Moshi. Despite being absolutely exhausted we were all very grateful to be back at the hotel to have a shower and to not be camping for a change. After having a good nights’ rest, we all met up for a late morning breakfast at the hotel. Derrick had driven through to Moshi from Arusha as he and Gareth were going to be leaving together on their own return journey. 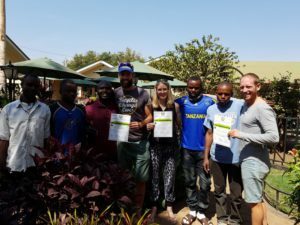 We then met up with Gilbert and Ngwasha and the rest of the team from Zara Tours including our chef, waiter and some of the porters for a short certificate ceremony where we also got to say our thanks to the team for making our Kilimanjaro experience one to remember. 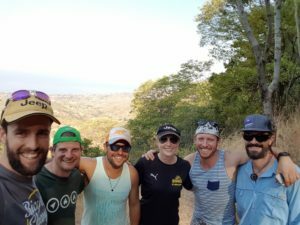 It was then time to part ways as the Kernes are going on a Tanzanian safari for a week and then driving back to Johannesburg and Derrick and Gareth are heading on their own adventure back to SA starting with a trip to Zanzibar. 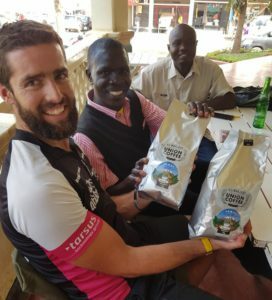 The Joburg2Kili for Qhubeka Expedition has been an incredible journey for the whole team but what has made it extraordinary has been all the wonderful support we have received both in terms of donations for Qhubeka as well as words of encouragement along the way from our sponsors, family, friends and fans. We are all extremely grateful for this and would like to say a massive THANK YOU to you all. 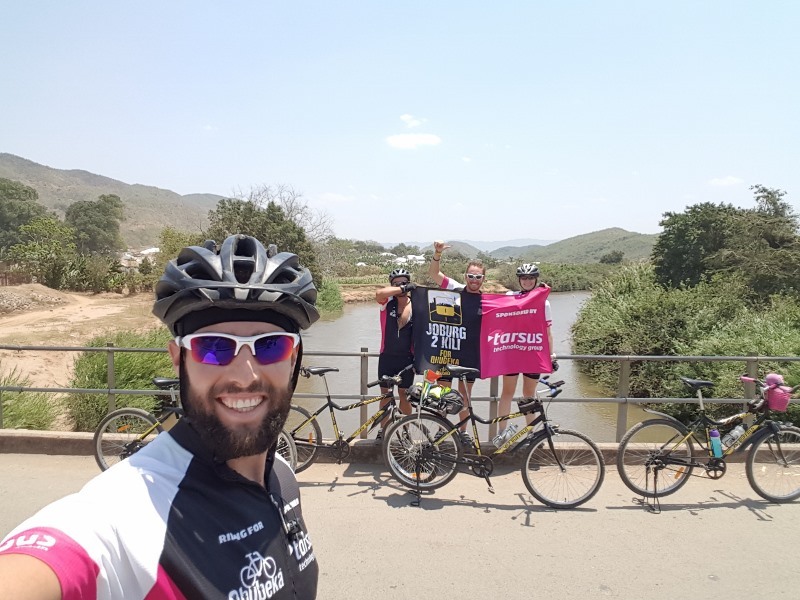 Warrick Kernes from the Joburg2Kili for Qhubeka cycling team recently caught up with Jon Gericke on the SAFM Sports Special about completing their 4650km expedition cycling from Johannesburg to Moshi at the base of Mount Kilimanjaro on Qhubeka Buffalo Bicycles. 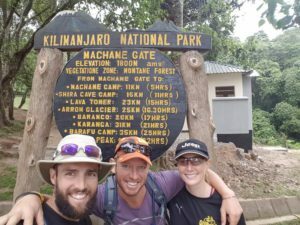 Three of the cyclists,, Warrick and Camilla Kernes and Gareth Pickering will now be climbing Mount Kilimanjaro with a planned summit on the 15th October 2016 which is also the Kernes 5th wedding anniversary. 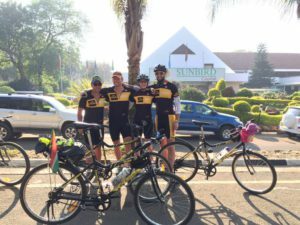 The Joburg2Kili team have made it to Arusha two days ahead of schedule after three days of seriously tough cycling from Dodoma. We have decided to have one rest day here in Arusha and then we will cycle to our final destination the town of Moshi at the base of Mount Kilimanjaro on Thursday 6th October. 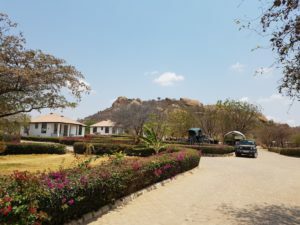 We spent one rest day in the capital of Tanzania, Dodoma at African Dreams Hotel who kindly let us camp on their premises. One of the highlights of Dodoma was definitely the Italian pizzeria called Pizzeria Leone l’Africano down the road from our hotel where we ended up having dinner two nights in a row as the food was excellent. From Dodoma we had a 95km cycle to a bush camping spot marked near Mbuyuni village. We knew that from Dodoma there was a chance of having to ride along some dirt road sections as they are still busy tarring the road through to Babatie. 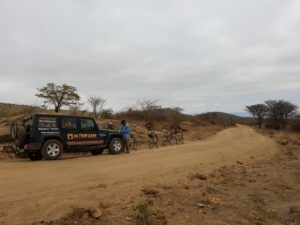 As soon as we left Dodoma we had a dirt road section for about 20km but luckily the rest of the road was tarred and was fairly easy riding all the way to Mbunyuni Village where we needed to find a suitable bush camping spot. We arrived ahead of Bryan who was busy in Dodoma stocking up on supplies so we found the turnoff to the local school where we planned to see if we could possible set up camp there. We struggled a bit to find someone that could speak English for us to get permission to stay at the school. Eventually we met a teacher who was able to speak some English and she indicated that we needed to visit the village office to get permission from the chief. So Warrick drove the Jeep down to the village office with the teacher to help with translating. After a bit of difficulty in terms of the language barrier, Warrick eventually managed to get the ok to camp on the school field from the chief. 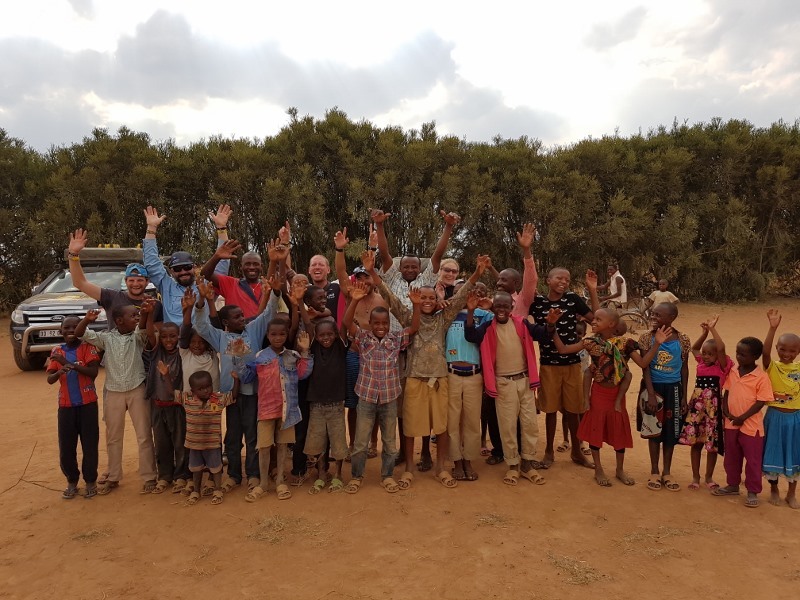 We then went to setup our campsite on the soccer field and were joined by at least 100 children and adults who were very intrigued and interested in what we were doing. We were also visited by various people throughout the evening including the chief who was dropped off on a motorbike by a local called Emmanuel and his brother who spoke really good English. Emmanuel helped us to organise some firewood so we could braai and he also taught us a bit of Swahili. Warrick decided to race one of the children in a cycle race on the soccer field from one set of goal posts to the other which was lots of fun to watch and the children in the village all laughed and cheered. Gareth and Derrick were on dinner duty that night and they enjoyed teaching some of the children some English words for some of the foods they were preparing. It certainly was one of our most memorable bush camps to date and a truly authentic experience to be part of a local Tanzanian village. From Mbunyuni Village we planned to cycle 90km to Amarula Campsite but we ended up changing up our plans during the day which ended up making this one of our toughest and longest cycle legs of the journey. 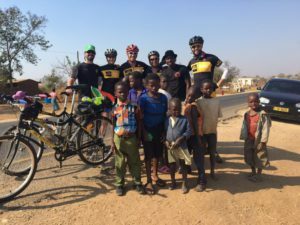 About 20km into the cycle we hit a dirt road which continued for 40km through a hectic rocky and dusty mountain pass where it was particularly tough going on our steel framed, single-speed, back-brake-pedal Qhubeka Buffalo Bicycles. 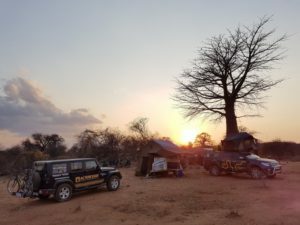 As soon as we hit the tar again, much to our delight, we heard from Bryan who had driven ahead to Amarula campsite that the camp was not quite what we were expecting with no electricity and only a bucket shower. 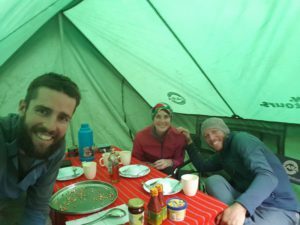 As we had a lot of meat in our freezer with low battery power we needed to have electricity that night so we all decided that Bryan should rather go ahead to find a campsite or lodge in the main town Babatie which was a further 70km away. He would then have to come back to shuttle us as it was too far for us to ride before sunset but we would ride until he met up with us. 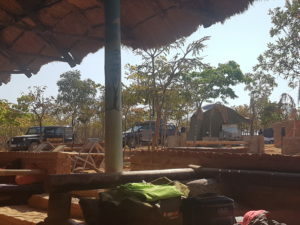 The plan did not go exactly to plan as it turned out that the road to Babatie is still under construction for 50km on a corrugated dirt road with a lot of climbing and so it took Bryan over 2 hours to get to the town and start finding a place to stay. As a result, we just had to continue cycling until Bryan was able to come back to meet us so we could load the bicycles and drive through to the town. We had some seriously tough climbs and shortly before sunset Warrick’s front tyre got a puncture. As we were replacing Warrick’s front tyre with a spare tyre, Bryan caught up with us much to everyone’s delight. 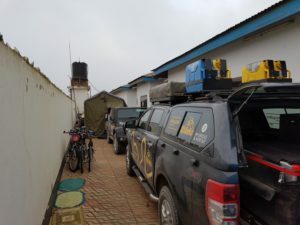 We then loaded the bicycles onto the two cars and drove the mountainous pass through to Ango Lodge in Babatie where Bryan had arranged for us to camp. It ended up being our longest day on the bicycles close to 10 hours for only 126km. The next day we packed up camp and got shuttled back to the spot where we had ended the previous day. We decided to push ahead a further 100km to get close to Lake Manyara, which would put us two days ahead of schedule. However, we had a slow start as literally 1km into the ride, Warrick’s front tyre was giving issues. We replaced the tyre and inserted a new tube and then as he rode again the tyre went flat again so we had to replace the tube once more which thankfully was a success. We had about 20km left of riding on a very corrugated dirt road and so our bicycles took a beating and by the time we hit the tar road again, Warrick’s front rim of his tyre had bent so we had to replace a spoke on his old rim and then rebuild the tyre. Thankfully the rest of the ride was relatively easy and we had no more mechanical issues. Bryan had gone ahead to arrange us a campsite. Unfortunately, the first place we had earmarked to stay on Lake Manyara wouldn’t allow us to camp so we pushed onto Zion Campsite which is on the road to Tarangire National Park. Whilst setting up our camp we noticed some heavy rainclouds building in the distance and before we knew it we had our first thunderstorm of the trip. 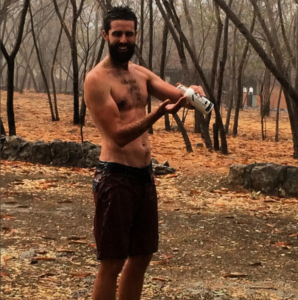 The rain came down really hard and the boys all enjoyed having a shower in the rain. Yesterday, we decided to push on towards Arusha for a 100km cycle. Derrick’s mom and brother had arrived the previous day and had stayed at a place on Lake Manyara for the night. Bryan went ahead to fetch them so that they could join us and follow us as we cycled towards Arusha. We had a fair amount of climbing in the first half of the ride which was hard going on our legs along with our first bit of rain whilst cycling. Bryan, Derrick’s mom and brother followed us for a while and then went ahead to Arusha to meet up with some friends of Bryan’s cousins, the Dennis Family, who have very kindly let us stay with them. We all had a wonderful dinner last night at the Arusha Coffee Lodge and we are spending one rest day here in Arusha. Derrick, his mom and brother, Gareth and Bobby have all gone on a day safari to Ngorongoro Crater whilst Warrick, Cam and Bryan relax in Arusha. And tomorrow after cycling over 4500km from Johannesburg we will be heading through to our final destination, Moshi, at the base of Mount Kilimanjaro, which is a bit surreal but very exciting for us all. We have made it to the capital city of Tanzania, Dodoma, after four days of riding in some serious heat through Masai land. Along the way we also reached the 4000km mark on our journey from Johannesburg to Moshi at the base of Mount Kilimanjaro. 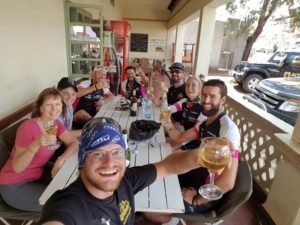 On our cycle leg to Ngwazi Sailing Club we came across a German called Daniel who was cycling from Cape Town to Cairo. We mentioned to him that we would be staying the night at the Ngwazi Sailing Club and we would be happy for him to join us. Warrick shared with him the co-ordinates but we had expected there to be some signs to the place but there were none but alas Daniel managed to still find us. We spent one rest day at the beautiful Ngwazi Sailing Club, which was in fact Warrick’s birthday. We spent the morning doing some errands which included fixing Warrick and Gareth’s back-wheel hubs and just giving the bikes a much-needed clean. The rest of the day we just relaxed around camp and Derrick and Gareth prepared a delicious birthday braai for dinner. The next day we had a 90km cycle ahead of us to African Gardens Campsite which is about 10km from the main town Iringa. Derrick was feeling a lot better after having completed a course of the malaria treatment medication so he decided to get back on his Buffalo bicycle again. The first 40km of the ride were really tough as we had roadworks and ended up having to cycle along dirt road diversions with some big climbs. However, as soon as we got through the town called Mufundi there were no more roadworks and we had an awesome smooth road to ride on with a wide shoulder all the way through to African Gardens Campsite. Whilst we were riding, Bryan drove ahead to Iringa to stock up on supplies before going back to setup our campsite. 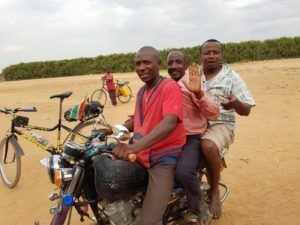 He also gave Daniel a lift as he was having issues with his bicycle so he was going to arrange a bus to Dar-es-Salaam from Iringa. Daniel decided to also stay at the same campsite with us that night. The next leg of our journey was a long and really hot 116km cycle through to a bush camp by the Mtera Reservoir. 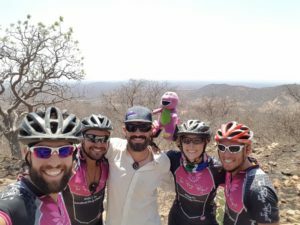 In the first 20km we had a serious climb up to the main town Iringa where we spent a bit of time sorting out some admin including drawing some more cash. After leaving Iringa we felt like we were in the middle of nowhere as there is very little civilisation along the way. Around 90km from Iringa we cycled down this incredible mountain pass with amazing views of the Mtera Reservoir. As soon as we descended the heat picked up to 40 degrees so we were all suffering. Bryan went ahead to try sort out a suitable place for us to “bush camp” for the night and luckily managed to arrange for us to stay at a mission clinic with a Masai warrior as our security guard. Today we had a short cycle of 74km to the Tanzanian capital city, Dodoma, where we are now staying at the African Dream Hotel for one rest day. 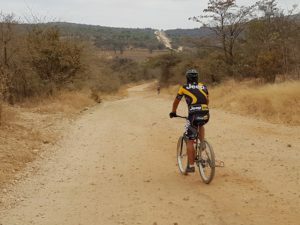 The first half of the cycle today was flat and really beautiful as we continued to ride past baobab forests and then we had a gradual climb up to the city. 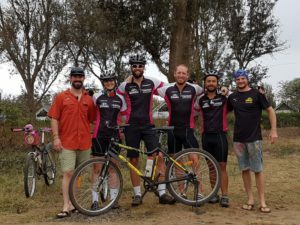 Time has really flown by on this phenomenal journey and we can’t believe that we only have 6 more days of cycling left to our final destination, Mount Kilimanjaro. 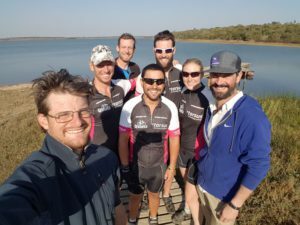 We have had some seriously tough riding over the past few days since entering our final country on the Joburg2Kili Expedition, Tanzania. 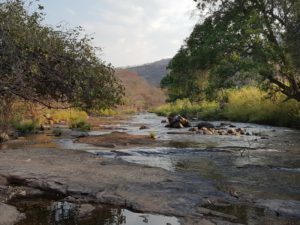 But before updating on how things have been going in Tanzania, as we haven’t had much luck with signal the past week here is just a quick update on our final days in beautiful Malawi. We had one rest day at Chitimba Camp by the Lake and decided to go check out the town of Livingstonia (Derrick also wanted to go to the hospital there to get a doctor to check on his knee which was troubling him). We had been warned that the road up to the town has 21 hairpin bends and you definitely need a 4×4 so we all jumped into the Jeep. The road was hectic with lots of rocky patches and narrow bends but the further you get up the mountain the more spectacular the views. We finally got to the top and found the local hospital which was quite an eye-opening experience. Unfortunately, the doctor wasn’t able to help Derrick with his knee pain so we headed back down the treacherous road. On our way down the mountain we stopped at the Mushroom Farm which is a lodge and campsite with incredible views looking over the Lake. 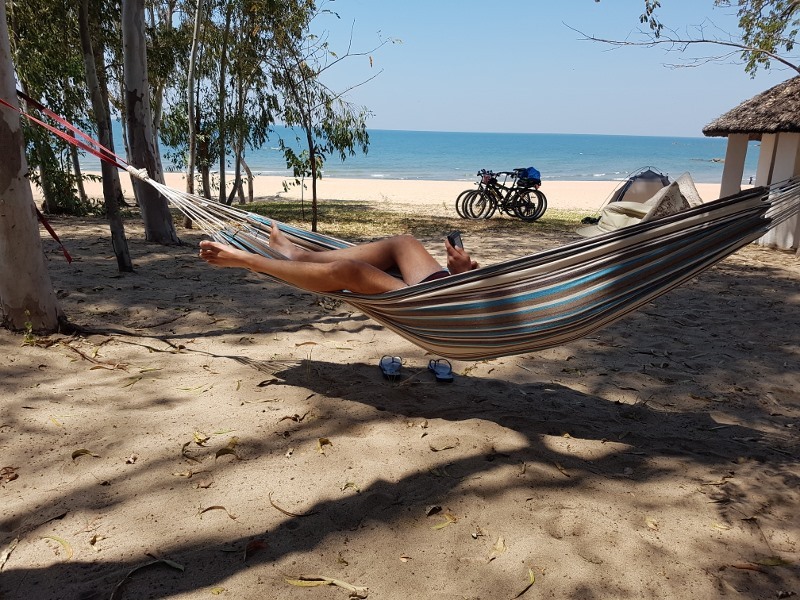 The next day we cycled a relatively easy 80km to our last stop along Lake Malawi called Mikomo Beach Lodge which is just before Karonga. As the only campers we were able to take the prime spot on the beach to camp for the night. It was then time to say goodbye to the Lake and make our way to Tanzania. We had an early start as we had a 60km ride to get to the border post. The ride was relatively flat and we made it to the border much earlier than we expected. Bryan had stayed behind at the campsite to fill the water tank on the trailer which can take up to an hour and so he was still behind us when we got to the border so we had to just sit around and wait for him. We then headed over to the Tanzanian side and we all thought things were going quite smoothly until you have to start the whole car registration process. We ended up waiting for 3 hours to get both cars and the trailer processed including travel insurance so we were all feeling quite exhausted by the time we had to start riding again. One thing that has been so interesting to note on this journey is that as soon as you cross over a border you instantly notice you are in a new country as the people, vegetation, signs, houses and advertising are all different. Crossing into Tanzania the terrain changed from dry savanna to tropical forests. The last 50km were really tough for us all not only because we had already had a long day waiting at the border but because we ended up climbing over 1000m in elevation. The day was running away from us and we only got to the turnoff point to the Rungwe Avocado Company where we were staying for two nights as the sun was setting. Bryan met us at the turnoff and we loaded the bicycles onto both the Jeep and Ford and drove up to the farm. Warrick was put in touch with Rob who owns the farm and we were all very grateful to both him and his wife Petra for letting us stay at their amazing farm. The next day we had a rest day and decided to go and check out the Ngozi Crater Lake which Warrick had read about online. Derrick’s knee was still troubling him so he decided to give the hike a miss. The rest of the team jumped into the Jeep and we made our way to the start of the hike. Rob had mentioned to us that we must make sure to pay the entrance fee and to try get a security guard for our car as the place is quite remote and there had been incidences in the past. We got to the turnoff and noticed that there was no guard at the hut so we waited around for a bit and eventually two locals arrived who we negotiated with on the price and one of them called First jumped into the Jeep with us to be our security guard. We had to drive down quite a rocky and narrow road to get to the parking lot at the start of the hike. 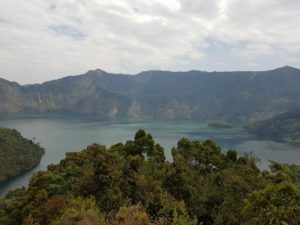 The hike took us about 30 minutes which takes you through a beautiful forest to a viewpoint looking into the crater lake which was really spectacular and untouched. We then headed back down to the Jeep and found our car guard had done a runner which was very annoying. As we drove back up the rocky and narrow dirt road we came across a Toyota vehicle with some hikers we had seen on our way up that were stuck in a rocky section of the road. They were locals and didn’t speak any English but through some hand signals we managed to explain to them that we would try get them out with the Jeep using a tow rope. The first challenge was to get the Jeep past them as they were stuck in a gorge. They managed to reverse down and make just enough room for the Jeep to sneak past and then we got the tow rope all setup. The Jeep managed to hurl the Toyato out of the rocky patch it was stuck in with ease and we then said our goodbyes to some very grateful Tanzanians. To view a video of the Jeep pulling out the Toyota, click here. We then headed back to Rungwe where we picked up a few supplies and Bryan sorted out some sim cards for the team which took a couple of hours. We got back to the Avocado farm just in time to enjoy the sunset. Derrick was not feeling at all well and had slept basically the whole day. Luckily Rob’s wife, Petra, is a doctor and she did a few tests which indicated that he might have malaria but she wanted to do some more tests at her practice in the nearby town Mbeya the next morning. 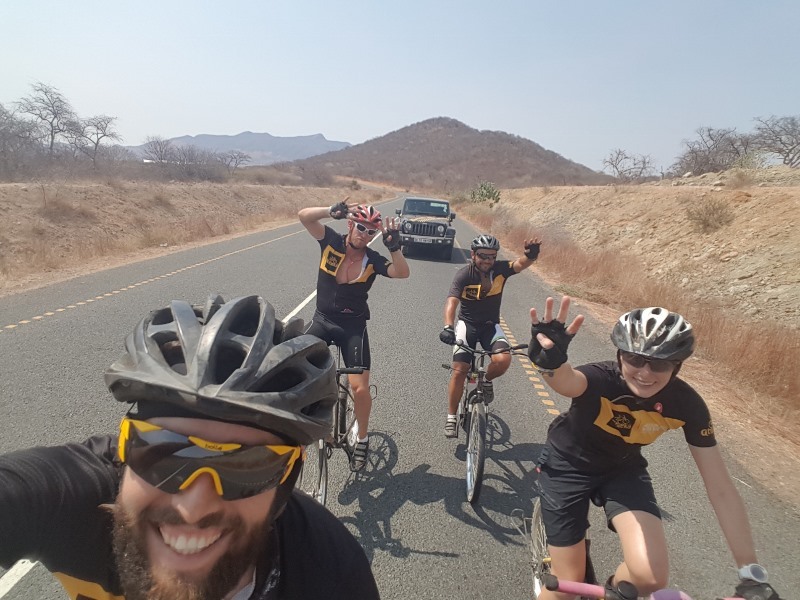 The next day, Gareth, Cam and Warrick headed off on a really tough 128km cycle to a place called Riverside Campsite with Bobby in the Jeep following behind them. Derrick and Bryan went ahead to Mbeya so Derrick could get some more tests done and Bryan could get a few supplies. The ride was seriously tough with close to 1500m of climbing. The last 60km were also on a really bad road with plenty potholes and big trucks and buses flying past. We also had quite a few mechanicals on this leg having to replace both Warrick and Gareth’s back wheels and Gareth getting a flat tyre. We eventually got to Riverside campsite which doesn’t have much in terms of facilities but is a beautiful location on a river. Derrick got the results of his tests which had come back that he didn’t have malaria but was just burnt out and needed to take it easy for the next few days. The next morning, we planned to ride close to 90km and would then hopefully find a suitable bush camp to stay at for the night. Derrick received more results of the tests that were done and it turned out he does have malaria but luckily he had continued with the treatment and was already feeling a lot better but would not be riding for at least another 2 days. The cycle was once again really tough with over 1000m of climbing, a headwind, busy roads that were under construction so we often had to ride on these dirt road diversions which were super dusty with all the trucks and buses driving past. 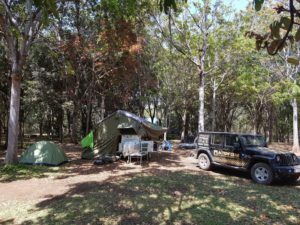 Bryan went ahead to find a place for us to setup camp but unfortunately the best he could find was Amana guest house in a little town called Makambako where the team decided to take rooms rather than camping but Warrick and Cam setup their trailer tent in the car park. We were all feeling really exhausted and decided to find a restaurant for dinner which ended up being very average. Today we had a short but really hilly 65km ride to Ngwazi Sailing Club with over 700m in climbing. It was also really misty and cold when we left town, which also made the start of the day more challenging. We had our first near accident as Cam braked suddenly as it seemed as though a truck was about to drive in front of her which caused Warrick to come off his bike but thankfully he has no injuries. We will be staying here at Ngwazi Sailing Club for one rest day tomorrow, which happens to be Warrick’s birthday. 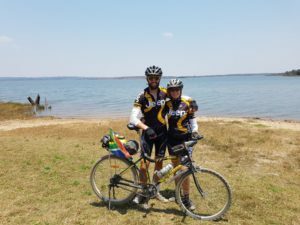 After three relaxing rest days in Senga Bay, it was time to get back on our Qhubeka Buffalo bikes and start heading north up the lake to Nkhotakota. 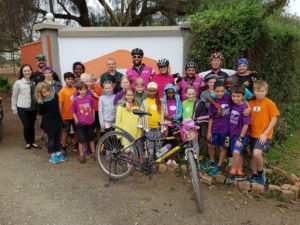 We packed up camp at first light, said our goodbye’s to Sam from the wonderful Cool Runnings Campsite and started our 128km cycle we had ahead of us. The Armstrong’s met up with Bryan to help with some of the shopping that was needed to be done and to follow him until they caught up with us on the road. Cam’s mom, Charlotte, wanted to ride along with Bobby in the Jeep to get the full experience of what it is like to drive behind us cyclists at around 18km/h. Cam’s father, Bill Armstrong and Bryan then drove ahead to sort out the accommodation for the night. The Armstrong’s had already booked into a place called Kwathu Lodge for the night but they did not offer camping so Warrick had found a place on his mapping software called Fish Eagle Lodge down the road from Kwathu Lodge, which he asked Bryan to go and check out whether we could stay there. The 128km ride was fairly flat the whole way but it was really hot with a bit of wind. Bryan was successful with arranging camping at Fish Eagle Lodge so we followed the signs there. Once we arrived we were looking for where the campsite had been setup but we were pleasantly surprised to find Bryan, Bill and a group of locals by the Ford and trailer which was very much stuck in the beach sand. Bryan hadn’t deflated the tyres enough before driving through the sand to where we were going to be camping and got stuck. The boys got off their bikes and all started to deflate the tyres to try give the car some traction to get it out the sand with the trailer. 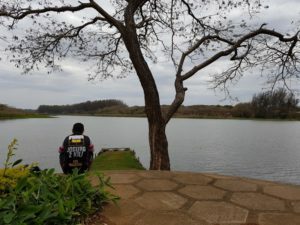 After a few attempts they were eventually successful and got the car and trailer out the thick sand to this amazing campsite that looks over the lake and we have our own personal lapa to ourselves. The Armstrong’s accommodation unfortunately was a bit of a disaster. Kwathu Lodge is nothing like it is advertised online and doesn’t have a bar or restaurant. 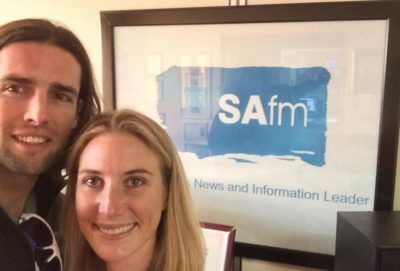 As a result, they decided to rather forfeit their deposit at the run-down Kwathu Lodge and book into the chalets at Fish Eagle Lodge. We spent our rest day at Fish Eagle Lodge just relaxing and catching up with the Armstrong’s. Gareth and Bryan went out onto the Lake on a catamaran they organised with the lodge. 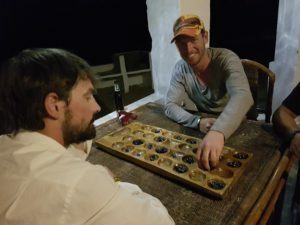 Warrick asked one of the staff at the lodge to teach him how to play a local game which involves marbles and a wooden carved board called Bawo. He then taught us all to play which is a lot of fun and we are hoping to buy our own set of the game when we get to a local market. That evening the Armstrong’s kindly treated us all to a dinner at the restaurant at the lodge. The next day we all got up at sunrise to pack up camp to head further north up the lake to Ngala Beach Lodge. We also had to say goodbye to the Armstrong’s who were going to go back to the Sunbird Livingstonia Hotel in Senga Bay for a night as they have a late morning flight to catch back to Johannesburg from Lilongwe today. The cycle to Ngala Beach Lodge was around 92km. The route profile was fairly flat with a few rolling hills but we had a headwind to deal with that thankfully wasn’t as difficult to ride in as we expected as it was blowing a gale when we left Fish Eagle Lodge. 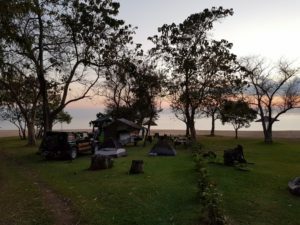 Ngala Beach Lodge is a really beautiful campsite with great views looking over Lake Malawi. From Ngala Beach Lodge we had a short ride of 75km to our next campsite along the lake called Chintheche Inn, which was recommended to us by the very helpful lady Sandy from Ngala Beach Lodge. We are here for one night and will be heading through to Mzuzu tomorrow for what we believe to be a very hilly cycle leg. Where the Malawi are we? Posted on 5th September 2016 1 Comment on Where the Malawi are we? 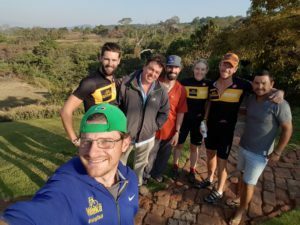 We spent our last day in Zambia on a rest day at Mama-Rula’s Campsite in Chipata which was much needed after some hard days of riding our Qhubeka Buffalo bicycles. Bobby was still not well and so he decided to go through to a local doctor, which was recommended by the owners at Mama-Rula’s. The doctor did some tests and gave him a dose of anti-biotics, which seem to be working well and Bobby is back to his normal entertaining self. On Friday we all got up before sunrise to get packed up and ready to head off to Malawi. 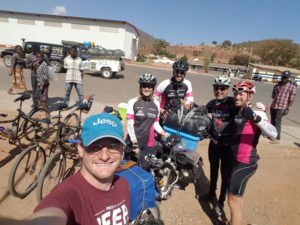 After our 3 hour experience at the Kazungula border crossing into Zambia we thought we better give ourselves plenty time to get through the Chipata border into Malawi especially as we still had just over 100km to ride that day to get to the Duck Inn. We were much better prepared this time for the border crossing having gotten local Malawian Kwacha the day before and being better informed about the costs to expect to incur to get the cars through the border. However, it still took us about 2 hours to get through but it was a much easier process. At the border we met up with Favio M Giorgio from Argentina who is cycling around the world. 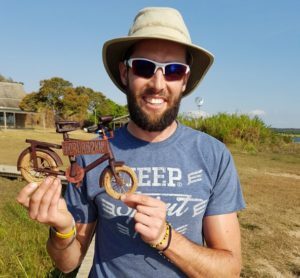 His bicycle weighs about 65kg with all his worldly belongings on him and we wish him all the best with his incredible journey. Once through the border the ride was fairly flat and downhill for most of the way to our planned campsite for the night called the Duck Inn. Although the Duck Inn is not really a campsite, Warrick managed to speak to the manager, Scott, who was happy to have us come through to stay for the night. It really is such a beautiful spot looking over a big dam with lots of birdlife – a real gem. From Duck Inn we had a short ride of just over 50km to Lilongwe. We were in for a real treat in Lilongwe as Shahid Samamad from Pulsit Electronics who is a contact of Derrick’s family very kindly put us up at the Sunbird Capital Hotel for the night. Big thanks to them as it was such luxury to be able to sleep in a bed for a night – it really is the small things you come to appreciate so much more when camping for nearly 5 weeks. Warrick was in contact with Scott again from Duck Inn who recommended a restaurant for us in Lilongwe called Kat-man-doo where we all went for dinner- the Nepali Momma’s are amazing! Yesterday we got up at sunrise after a great nights’ rest at the hotel and enjoyed having a buffet breakfast before starting our 120km cycle through to Lake Malawi. We originally had planned to do this distance in two legs but decided to rather just get it done in one go and enjoy an extra rest day at the Lake. In the first 20km of the journey we were met by Peter from the Malawi Travel Guide who came to meet with us which was really great. He has an awesome website called Travel Malawi Guide with all the info you need to know on where to go in Malawi. The first 60km of the ride was really hard going as we had about 900m of climbing and we also had a 30km/h headwind we were riding into. But thankfully as you head closer towards Salima the route flattens out although the road is very eroded and so you have to be very careful as you ride through to Senga Bay. On our first day in Malawi riding on-route to the Duck Inn two British couples drove past us and stopped to find out about our journey. 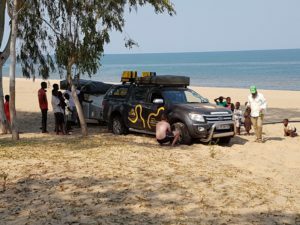 We managed to see them again on our ride to Lake Malawi yesterday and they had just come from Senga Bay and recommended we definitely stay at Cool Runnings Campsite which is where we are now based for the next 3 days. 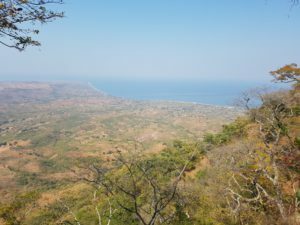 Derrick and Cam’s parents will be joining us in Senga Bay and staying at the Livingstonia Sunbird Hotel which is about 1km away from Cool Runnings. Lake Malawi is a really beautiful place and we are all looking forward to spending time here.